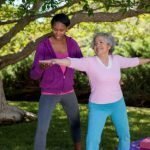 With the approach of warmer weather, people of all ages venture outdoors to enjoy many different types of activities that can help them maintain good overall health. Regardless of mental or physical capabilities, there are a variety of summertime options older adults may enjoy. Here are a few exciting summer activities that are safe for seniors to engage in. Some older adults enjoy going to beaches, parks, and other locations equipped with a metal detector in search of hidden treasures. Going on a treasure hunt with a metal detector can be enjoyable for their grandkids as well. The detector need not be expensive, and different types are capable of finding specific kinds of metal. Some seniors consider treasure seeking a serious hobby and travel to various destinations in hopes of locating unusual items. The walking involved when detecting and uncovering items is a great way to get exercise. If your aging loved one needs assistance with exercising, consider hiring a professional caregiver. Dayton home care experts are available to provide high-quality care to seniors on an as-needed basis. From assistance with mobility and exercise to providing transportation to the doctor’s office and social events, there are a variety of ways professional caregivers can help your aging loved one continue to live independently. Pickleball has become particularly popular with older adults. The court-based game is played similar to tennis. However, players use a plastic Wiffle ball and a lightweight, paddle-shaped racket. Seniors can learn the basic rules of the game and play on a backyard patio or driveway with family members of all ages. Along with enhancing balance and flexibility, the game also increases upper body range of motion. Many seniors who enjoy pickleball belong to teams and clubs. Whether ambulatory or in a wheelchair, older adults might enjoy venturing to a local park or nature reserve to take in the fragrances, sights, and sounds of the area. Many locations have paved pathways that readily accommodate wheelchairs or other mobile devices. A nature walk can include family or friends and provides a great chance to socialize while getting a little bit of exercise. Seniors can take beverages and snacks to enjoy along the way. If the location is known for wildlife viewing, they should take a camera as well. Many seniors find activities like walking more enjoyable with a companion. For families living in Dayton, respite care can be a wonderful solution when their aging loved ones need companionship and socialization a few hours a week or just need minor assistance with daily household tasks. At Home Care Assistance, we thrive on helping seniors maintain their independence while living in the comfort of home. Seniors can pack up their favorite summertime foods and head to the park or a local lake with the rest of the family. A picnic can also take place in the backyard. If able, older adults might also enjoy helping with food preparation. Picnics are the perfect setting for an outdoor family reunion. Seniors typically love watching the antics of children at play and the chance to spend time with loved ones. Seniors can fish from the shore, on the dock, or aboard a boat. Many older adults have the patience to sit, relax, and socialize while waiting to snag a fish, and they are also typically eager to pass their knowledge and skill on to younger anglers. Fishing does not require a great deal of expensive equipment and provides the chance to make special memories that last a lifetime. As seniors age, it can become challenging to participate in activities outdoors. Seniors can face a variety of age-related challenges. Though some families choose to take on the caregiving duties, there may come a time when they need a trusted Dayton senior care provider. Families sometimes need respite from their duties so they can focus on their other responsibilities, and some seniors need around-the-clock assistance that their families are not able to provide. Home Care Assistance is here to help. Call us today at (937) 353-1412 to request a free in-home consultation.